The FAQ is intended to provide basic information, sometimes about fairly complex topics, and will often link to more detailed information in other areas of the FieldNotes documentation. In some cases additional information is available on external websites and publications, in which case the FAQ provides summary information together with the relevant references or links. Whilst every effort has been made to ensure accuracy, information provided by third-party organisations may change or be removed without notice. Please contact contact Green Man Software Ltd with corrections or additions. Please note that external links are provided for information only, and we cannot assume any responsibility or liability for materials available at linked sites, which are beyond our control. What features does FieldNotes have? Will FieldNotes work on my computer? Can I try out FieldNotes free of charge to see if I like it?. Will FieldNotes work on my smartphone / tablet? Where can I obtain a copy of FieldNotes from?. My friend has a FieldNotes CD from Green Man Software - can I use that?. Does my computer need any particular hardware to use FieldNotes? Will I need to buy or download additional software (eg. databases) to use FieldNotes? Will I need someone to install FieldNotes for me?. Is the database difficult to set up? How can I change the Screen Resolution on my Computer? Can I really try it out for free?. How much does FieldNotes cost?. Why is FieldNotes licenced on an annual basis?. Do I get any additional benefits from paying the licence fee?. Does it entitle me to a free parking space if I visit your offices?. My anti-virus software reports a security issue when I use Help. If you require further information, please contact Green Man Software Ltd directly. FieldNotes is an exciting new concept in wildlife recording, offering a unique, step-by-step introduction to Wildlife recording methods and classification systems, and providing an intuitive workflow that includes all the information and resources you need to explore your local environment. FieldNotes combines extensive data-sets, powerful data-processing functionality and easy-to-use visualisation tools, allowing you to quickly create and share detailed wildlife observations - whether you live in the heart of the city or remote countryside. 1.2 What features does FieldNotes have? It's a whole new concept in recording! 1.3 Will FieldNotes work on my computer? There are no versions available for Mac or Linux operating systems, and currently no plans to cover these platforms. 1.4 Can I try out FieldNotes free of charge to see if I like it? I'm not convinced that it's better than my current recording software. It is! New installations of FieldNotes include a free trial period, so you can have a good go before you decide to buy it. During the evaluation period the software is fully functional, so you can compare it against your usual recording software. Let us know your thoughts - you can email us directly at Green Man Software Ltd, or use the feedback form on our website. 1.5 Will FieldNotes work on my smartphone / tablet? In response to a large number of requests, Green Man Software is currently developing a FieldNotes interface for Android smartphones and tablets. This app will be free to download and use. We are keen to involve a wide cross-section of the recording community in the development process, and welcome comments and suggestions about user requirements, useability and any other issues that you feel are important. No technical knowledge required! Details of the project (including an outline spec) are available on our website http://www.greenmansoftware.co.uk. 2.1 Where can I obtain a copy of FieldNotes from? 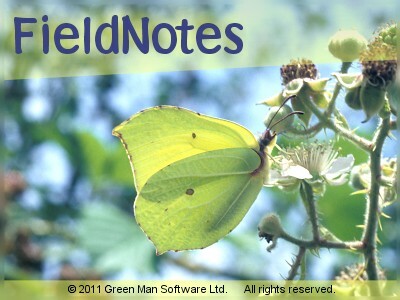 FieldNotes may be downloaded from a number of software sites on the internet (preferred method), and is available on CD, and on other media (by request) from Green Man Software Ltd. The FieldNotes website http://www.fieldnotes.co.uk/ contains details of download sites and software availability. 2.2 My friend has a shareware version of the FieldNotes CD from Green Man Software - can I use that? Yes, by all means. We encourage users to pass on FieldNotes CDs to interested friends, to help reduce material waste. However it is worth checking the latest version information on the FieldNotes website http://www.fieldnotes.co.uk/product/versions/ to ensure that the CD is not out of date. 2.3 Does my computer need any particular hardware to use FieldNotes? Microsoft� Windows� 9X, NT4 (Service pack 3a) or later (Windows XP recommended). 1024 by 768 or higher screen resolution, and reasonable colour monitor (True-colour recommended). 170 MB of free disk space. FieldNotes is not suitable for use on tablet-style computers without a keyboard or mobile phones. However an Android interface is currently under development for mobile devices running Android1.5 or later. 2.4 Will I need to buy or download additional software (eg. databases) to use FieldNotes? 2.5 Will I need someone to install FieldNotes for me? Where should FieldNotes be installed (the destination folder) on your computer? How do you want FieldNotes to appear in the start menu? Do you want to create a FieldNotes desktop icon? And you can quite safely ignore all three inputs - the default options will provide a perfectly good software installation on your computer. There is (of course) a comprehensive tutorial to guide you through the installation process. Note that FieldNotes must be installed by a user with Administrator privileges, otherwise certain installation procedures (eg. registry entries) may fail. 3.1 Is the database part difficult to set up? In a word - no. Its mostly done "behind the scenes" in response to a simple set of requirements provided by you. Furthermore, there is a comprehensive tutorial to guide you through the setup process. Try it and let us know if you think we could make it any easier!. 3.2 How can I change the Screen Resolution on my Computer? you will need to update your screen resolution to display some of the data-entry forms correctly. There is a simple tutorial to guide you through the process. 4.1 Can I really try it out for free? Yes! New installations of FieldNotes include a free trial period, so you can have a good go before you decide to buy it. During the evaluation period the software is fully functional, so you can compare it against your usual recording software. Let us know your thoughts - you can email us directly at Green Man Software Ltd, or use the feedback form. 4.2 How much does FieldNotes cost? The cost of a single FieldNotes licence depends on the context in which the software will be used - for example companies can expect to pay more than personal users. Details of the different licence types and relevant fees are available on the FieldNotes website (http://www.fieldnotes.co.uk/notices/). Note that FieldNotes is licenced on a subscription basis (renewable annually). 4.3 Why is FieldNotes licensed on an annual basis? FieldNotes is also constantly being improved to encompass a wider range of recording activities, extend reporting mechanisms and facilitate data exchange. The low annual licence fee assures software continuity and support into the future. 4.4 Do I get any additional benefits from paying the licence fee? Your licence entitles you to the latest upgrades and releases of FieldNotes software, databases, dictionaries, libraries, tools and associated documentation. Also included is limited technical support if things suddenly go wrong. or simply getting involved in relevant wildlife projects and surveys. 4.5 Does it entitle me to a free parking space if I visit your offices? Ummm, No. Possibly. But don't count on it. A program is automatically trying to change your system settings. If this is unexpected, the program may be a virus and you should click 'block'. The message is rather misleading, as FieldNotes is simply starting a program (your browser) that you probably use every day. However the action itself could rightly be considered a security threat as the antivirus software cannot check which external website is being opened. 1. You may be able to avoid the problem by changing the settings on your anti-virus software, for example by adding FieldNotes to a list of trusted applications. 2. If you prefer not to do this, keeping a web-browser window open while you work will resolve the problem in many cases, as the Help documentation will be displayed on a new tab. 3. You may decide to navigate to the relevant Help pages yourself, in which case the online documentations set (http://www.fieldnotes.co.uk/documentation/) is probably the best starting point. Scan the extensive features list or check the product description to compare capabilities. download a copy or request a CD today! © 2014 Green Man Software Ltd, Oxfordshire, UK.